Styling – What do you want styled? …now this is why I love NYC. Well, there are other reasons too. Have you seen Anthro’s new design/layout? While it’s definitely going to take some getting used to, what are your initial thoughts about it? Me? I’m a bit annoyed, to be honest. On the positive, I like that they’ve moved the bags under the accessories section, instead of with the shoes, as it was previously (although I might forget about this switch when compiling stylings!). Negatively, first and foremost, the site doesn’t fit my window quite right. Is anyone else having this issue? And also, the “view larger” takes you to a big, huge image of the product. While this might be helpful while examining a product you want to buy, it’s a bit of a nuisance for the blogger in me…in order to get it scaled down correctly for a post, it is going to take about 10x longer than it used to (okay, that wasn’t a scientifically tested number, but it will take considerably more time!). So…hmmmm….I guess I’ll just have to see whether it grows on me at all, but at the moment, I can’t help but be a bit miffed. What about you though – what do you think? Is the new design better or worse than the previous design? On Sunday I told you about my strawberry picking turned strawberry shortcake eating fun! Today, I thought I’d share the recipe for those shortcakes! The great thing about these is that they’re quick to make and you might just already have all the ingredients on hand that you need! Hooray for that! The bonus about these delicious shortcakes?! They look fancy and oh, so chic, but they really are a cinch to make. YAY! Oh! And did I mention that everyone gets 2 shortcakes (which is the perfect amount)?! Score! So go ahead, make ’em! Then, feel free to tell me what you think! If you do have any questions about them, let me know! *Sorry I don’t have any pictures…they were gobbled up quickly! Cut fresh strawberries, slightly mashed with added sugar if necessary. Preheat oven to 350 degrees Fahrenheit. Line baking sheets with parchment paper. Combine the flour, salt, sugar, baking powder, and lemon powder/lemon extract in a large bowl. Using a pastry blender, two butter knives, or your hands (as I did! I learned during a baking class that this is a great method), add the butter to the dry ingredients. Break up the butter and combine it with the dry ingredients until the butter is pea sized. Add 1 cup of the heavy cream and stir until the mixture comes together. On a small floured board, dump out the dough. Using your hands, bring the dough together into a ball. Press out the dough to about 1/2-inch thick. Dip the lip of a glass in some flour. Then, use it as a cookie cutter. This will produce perfectly round shaped shortcakes. Continue this process. Clump the dough together as needed and re-press out to use up as much of the dough as possible. Lay the shortcakes , evenly spaced, on the prepared baking sheets. Brush the top of each shortcake, using a pastry brush, with the remaining 1 tablespoon heavy cream (you may choose to use more/less). Sprinkle the tops with the sugar. Bake in the oven until the bottoms are a light golden brown (around 10 minutes, possibly more). I recommend serving these warm. To assemble dessert: Place a spoonful of the prepared strawberries in a bowl. Place a shortcake on top. Place another spoonful of strawberries atop, and layer on another shortcake. Finish off with a bit more strawberries and top with as much – or as little (why???!!) – whipped cream as you want. Enjoy this positively summer dessert! Note: You could make these much thicker by rolling out the dough to about 1 1/2-inches thick. Accordingly, bake them longer. This will make for probably just one shortcake per serving. Yesterday, in my Mid-Week-Pick-Me-Up link share, I pointed out some Nutella Cheesecake Layer Bars that had my name written all over them. I mean, hello?!?! Nutella…and…cheesecake…YUM! I mentioned that there would be a good chance I would be making the bars soon. Well guess what? I made them already. From internet to reality, they’re now sitting in my stomach fridge. Well, they were good. Pretty darn good. Are they my favorite dessert ever? No. Then again, though, I do bake super-duper often, so I’m probably more jaded than some of you. Anyways, I still think you should give them a try! (And, of course, then tell me what you think of them!) And in terms of level of difficulty…these aren’t bad at all. Don’t be intimidated at all! *Some of you may not know this, but second to fashion, my heart lies with baking (and cooking, to an extent). While I don’t normally share recipes, I thought I would today because I did mention these bad boys to you yesterday. Grease an 8-inch-by-8-inch pan. Line with foil down the middle with an overhang on two opposite sides. Grease once more. In a food processor, crush the Graham crackers until they’re in fine crumbs. Add the cooled, melted butter and continue pulsing until evenly combined. Evenly press the mixture into the bottom of the prepared pan. Bake for about 12 minutes, or until set. Allow to cool. In a large mixing bowl, combine with an electric mixer until combined and smooth the room temperature cream cheese, room temperature eggs, sugar, 1/4 cup heavy cream, and vanilla extract. Remove about 1/3 of the mixture and place in a separate bowl (you can merely eyeball it or get fancy and use your kitchen scale). In the new bowl with 1/3 of the mixture, add 1 tablespoon heavy cream and all of the Nutella. Mix until incorporated. Carefully, using a spatula, spread the vanilla cheesecake batter over the cooled crust. Put the Nutella cheesecake batter over top in dollops, so as to make it easier to spread without mixing the two layers. Then, evenly and gently spread the Nutella layer. Bake in the oven for about 35-40 minutes, or until just the middle of the bars jiggle when the pan is moved. The edges may crack some and move away from the edges of the pan – this is fine. Allow to cool and refrigerate for about 3 hours (if you can wait that long). Using the tin foil handles, remove the bars from the pan and slice into however big of pieces you wish – I won’t judge! Enjoy! I told you on Friday how I was going out of town for the weekend…well, guess what? On my little trip, I saw a celebrity. Okay, maybe she’s not a celebrity celebrity (know what I mean? like Angelina Jolie? Sandra Bullock? etc? ), but a lot of you will probably know who she is. So does that count? Does that mean I saw a celebrity? Side note: Now that I keep typing “celebrity,” I’ve realized it’s quite a funny word. Don’t you think? Am I crazy? Try typing it 20 times in a row…okay, tangent=over. Originally, Tabatha, a hair dresser, was on the Bravo reality TV show called Shear Genius. Famous for being so harsh and outspoken, she got her own TV show (which I’ve actually never watched…) called Tabatha’s Salon Takeover. So no, I did not attempt running up to the elevator to talk with her or even say “hi.” Would you have tried to? Or would you have tried to play it cool like I did? Or, would have no idea in the world who she was?! Be honest! I’d love to hear the answers to these questions, as well as stories of any of your own random celebrity sightings! Alexander McQueen was a fashion great. An icon. An idol. A revolutionary. And that only made his death that much more tragic. Two weekends ago, while I was in NYC, I had the pleasure of attending the Alexander McQueen “Savage Beauty” exhibit at the Metropolitan Museum of Art. And, oh, goodness, I cannot recommend it enough! Seriously…there is no way to describe how much of a creative genius this man was. I think, however, it does take a certain person to fully appreciate his work. To some people, it just comes off as bizarre. However, if you take the time to look at each garment as a piece of art and to read all of the plentiful quotes throughout the exhibit, there’s no way you could not appreciate his creativity. He had a unique way of thinking and looking at the world. Were all his pieces meant to be worn by the average 9-to-5 worker? No. But that wasn’t his goal either…he was creating art, and high – runway – fashion was the way to communicate this art (not ready-to-wear fashion). This is why I highly encourage a visit to the exhibit. Yes, it can be crowded. However, yes, it is truly spectacular. The workmanship? Oh, don’t even get me started – absolute perfection. The exhibit shows until August 7th. If you get the chance to go, I’d love to hear what you think. If you already have gone, I’d also love to hear your reaction (even if you disagree with me!). And one last thought: While Kate Middleton’s wedding dress was in fact fabulous, and it was in fact created by Alexander McQueen’s house, do not expect the exhibit to showcase only pieces similar to this. If you go with the expectation of seeing Kate-esque dresses, you will be disappointed. So clear that misconception away right now, and enjoy the show for what it is! Guys, I am obsessed with something. No, really – obsessed. Obsessed! Are any of you as in love with this skirt as I am? Or are you thinking I am a tad crazy right now lost my mind…? Now, what would you call it? Personally, I would not just call it “pink”. Maybe “coral”? Anthro calls it “rose”, which I think fits nicely! Now, what would some of the guys in your life call it? 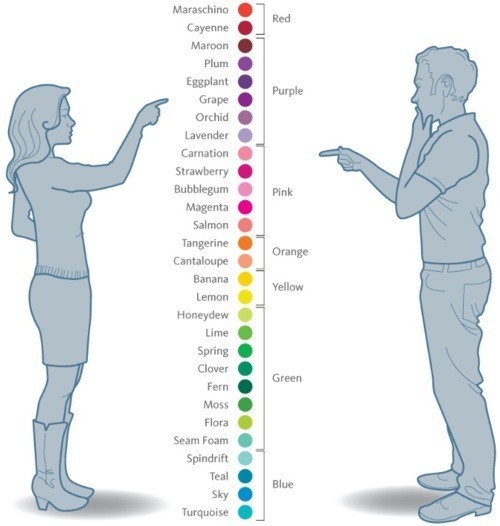 Probably, at least in my experience, you’d get a lot of “pinks” or even some other color, such as “orange”. And don’t get me wrong though…I’m not trying to criticize guys in any way, shape, or form…I just find this difference in genders to be quite amusing (and again, I’m using generalizations…of course there are many exceptions!). So what are some of your favorite colors? Rose? Pistachio? Eggplant? Evergreen? Sky? Bubblegum? Mint? Or, are you more of a straight-forward kind of girl – as in pink? red? orange? blue? Do tell! I’d love to hear!! !